4B Longhorns raises Registered Texas Longhorns 70 miles south of Tulsa Oklahoma. Welcome to the 4B Ranch! The 4B Ranch is located 70 miles south of Tulsa, Oklahoma and is nestled within the beautiful hills and valleys of the Cross Timbers Region. It is owned and operated by Michael and Allison Bose, who are natives of Texas, but now reside in Tulsa. Owning ranch property was always a dream of ours and the 4B Ranch is our very own “little slice of heaven”. With fertile grasslands and an abundance of water, the ranch is situated in a perfect spot to raise a happy, healthy herd of Registered Texas Longhorn Beef Cattle. The original idea was to acquire “pasture art” with a few ornamental Longhorn steers but it somehow evolved into a full blown cattle operation. We started out with 15 mama cows in 2011 and now have over 120 head of beautifully and uniquely painted cattle. Together with our daughters, Megan and Amanda, we cherish the opportunity to raise these magnificent animals. There’s nothing more enjoyable than parking the Ranger in the middle of the herd at sunset and watching the young calves run and play with their new friends. 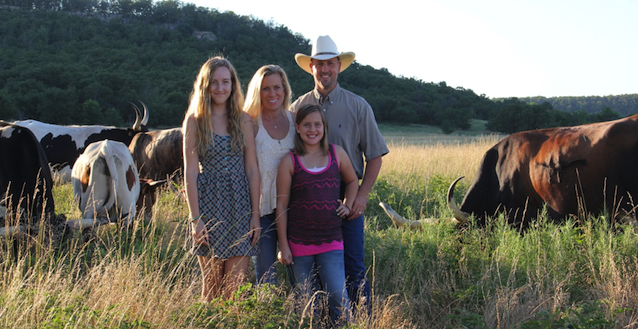 In addition to providing Registered Longhorn Cattle to new and existing cattle ranchers, we are also very proud to provide healthy, free-ranging, grass-fed beef to our family, friends and a growing list of satisfied customers. More and more consumers prefer knowing the origin of their beef and appreciate the fact our beef goes straight from the ranch to a local USDA facility for immediate processing. The folks that eat our beef truly love the natural flavor and the wholesomeness it provides. If you are interested in visiting our herd, purchasing some of our pure bred Texas Longhorns or perhaps some of our healthy beef, please contact us by e-mail or phone. Howdy from the 4B Ranch! The 2019 calving season is just around the corner! We should have 40-50 calves starting to hit the ground in early March. We'll post pics as we can! We still have several 2017 heifers available for sale. Please check out our heifer page for pedigree and pricing information. We have many great mama cows available which have been exposed to one of our herd sires to produce a spring 2019 calf. These mamas are great milkers and have sweet dispositions. We would love to help you build a quality herd of Registered Texas Longhorns and we'll deliver them right to your gate, regardless of how far away you are! Discounts available for multiple animal purchases. Please contact us for more information or to schedule a ranch tour. We're an hour and 15 min drive south of Tulsa, OK. 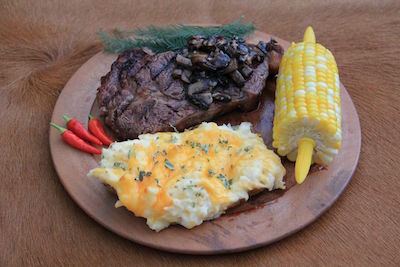 Please visit our LONGHORN BEEF page for information on our fresh, flavorful beef. The Texas Longhorn became the foundation of the American cattle industry by claiming first rights in the untamed, newly discovered Americas more than 500 years ago. In 1690, the first herd of cattle was driven north from Mexico to land that would eventually become Texas. By the Civil War, millions of Longhorns ranged between the mesquite-dotted sandy banks of the Rio Bravo to the sand beds of the Sabine. Most of the Longhorns were unbranded, survivors of Indian raids, scattered by stampedes and weather, escaped from missions or abandoned after ranch failures. Less than 40 years later, the Longhorn was closer to extinction than the buffalo. In 1927, the Federal government stepped in to help preserve the Texas Longhorn and a great part of our American heritage. Congress assigned forest service rangers, Will C. Barnes and John H. Hatton, to the task and these two men put the first herd together for Wichita Mountains Wildlife Refuge in Oklahoma. Gradually, more breeders started raising private stock, recognizing the value of Texas Longhorns. Today, the Texas Longhorn is a thriving cattle breed that offers breeders and beef consumers a bounty of benefits. Did you know that red meat can be included as part of a healthy diet? Thanks to Texas Longhorn Cattle, today’s health-conscious consumer doesn’t have to avoid tender, juicy steaks. -Longhorn beef is leaner than other breeds and is lower in saturated fats. -Longhorn beef is packed full of flavor and has less cholesterol and calories than white meat chicken. -Including lean beef in a heart-healthy diet can positively impact blood cholesterol levels. -Studies have shown that eating lean beef can help increase “good” cholesterol and reduce “bad” cholesterol in people with elevated cholesterol levels. 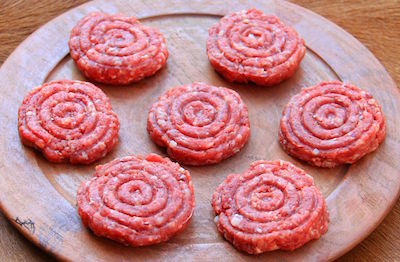 -Beef is the best source of protein, zinc and Vitamin B12 and is the third best source of iron in the food supply. -Beef is also a good source of selenium, which may reduce the risk of heart disease and certain types of cancer (such as prostate) as well as enhance the body’s ability to fight infections. To learn more or to place an order visit our Longhorn Beef page today!